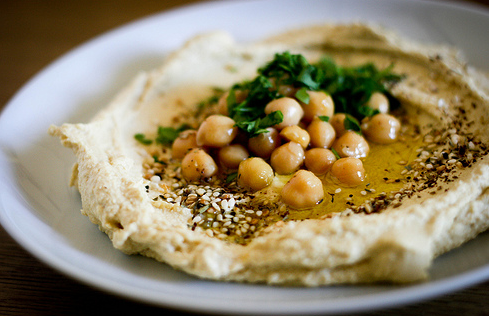 A Middle Eastern dip, made from chickpeas, Hummous appears on every menu in Israel and is served in most restaurants as part of the ‘salatim’ starter with warm pitta breads. The popularity of hummous in Israel stems from the ingredients in the dip follow the dietary laws of Kashrut and so can be eaten at the beginning of both meat and milk meals. A chickpea is a legume and rich nutrients. They are considered to be a popular source of vitamins and minerals in the diet of vegetarians and vegans. Coming from the Arabic word meaning ‘chickpeas’, hummous is made from store cupboard ingredients and if using chickpeas from a tin, there is no cooking involved in its making. Many combinations of spices are usually added for flavour with cumin, coriander or smoked paprika being the most popular. Garnishes include whole chickpeas, pinenuts, flat leaf parsley or paprika. However, other ingredients can be added to the basic hummous recipe adding colour and texture, including beetroot, green olives and sun-dried tomatoes. Sumac and za'atar are also used sprinkled on top to enhance the Middle Eastern flavour.